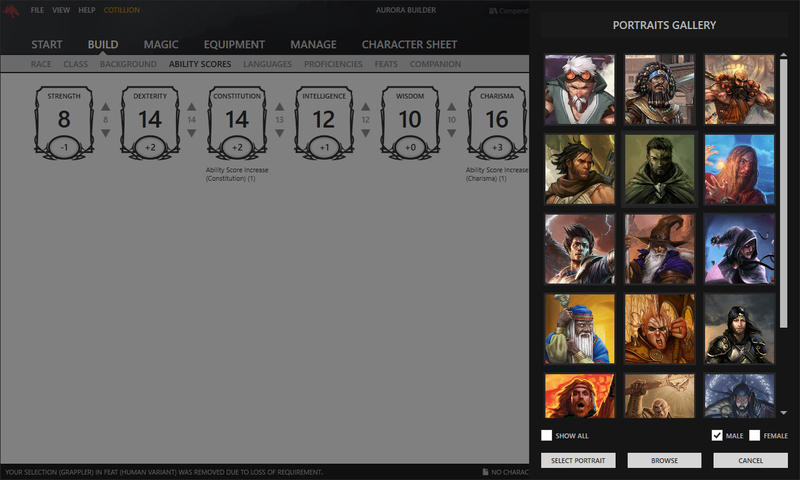 Get started with the Aurora Builder, a free tool for Windows that lets you create characters for your dungeons and dragons game using the bundled content, your own content, and content created by others. You can download the latest version below and install it on your Windows PC. After the installation is complete you can start the Aurora Builder from the newly created shortcuts on your desktop and in your start menu. When a new version is available you will be notified in the Aurora Builder and on the website. You simply install the new version over your previous installation. 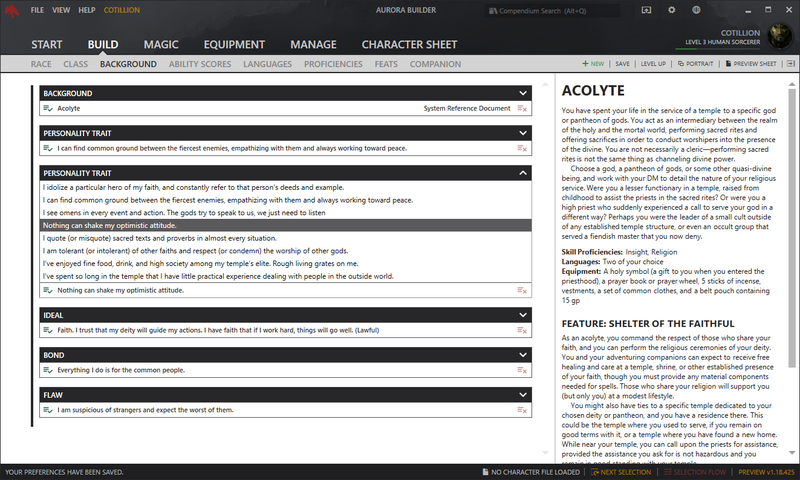 The Aurora Builder is a free tool that lets you create characters for your dungeons and dragons game. The bundled content contains the races, subraces, classes, backgrounds, feats, spells, and items that Wizards of the Coasts provides for free in the System Reference Document using the Open Gaming License. You can however extend the content by creating content files or importing files creating by others. 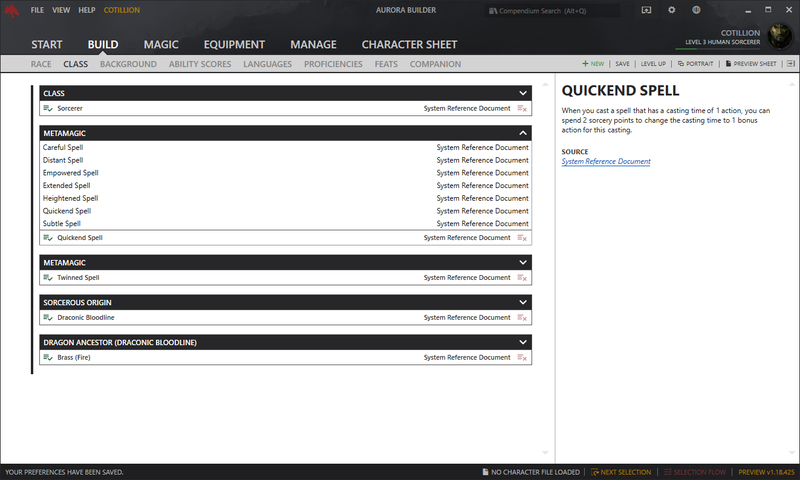 Learn more about ways how to extend the Aurora Builder from the support menu. This software is in preview and this quick guide was written for version 1.18.423. The user interface might alter slightly from the information below, buttons might have been moved, or the order or input fields may have changed. The first time you launch the builder it will appear a little empty. Once you create your first characters they will greet you in the Start tab. You can mark a character as 'favorite' and it will appear before any other character when you save them. Choose 'New Character' from the file menu or to create a new character. 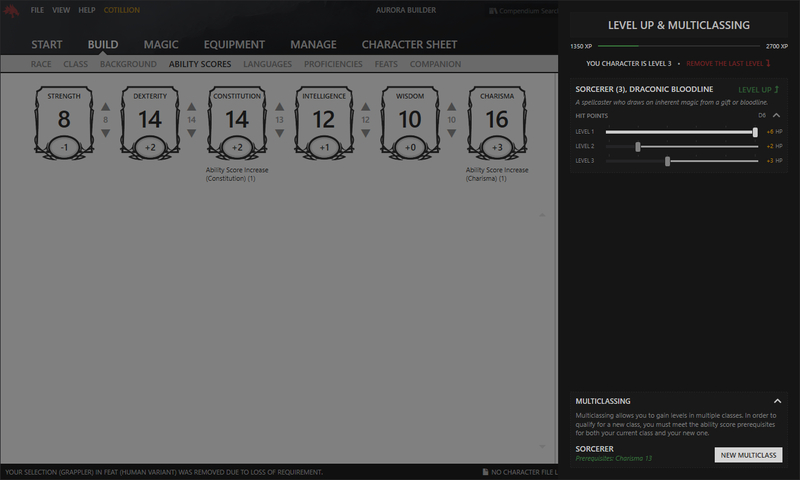 In the interface that is presented to you you can enter some basic information about your character such as a name, starting level, gender, and how you want to generate your ability scores. When you choose the Standard Array (15, 14, 13, 12, 10, 8) you can determine your scores by dragging and dropping them around on the desired ability. The other scores are assigned after creating the new character. All entries can be changed anytime after you create your character. The character options are often optional rules that you can enable or disable for your character, the user interface will change sometimes depending on what options you enable or disable. When you want to roll for your hit points each time you level up in your game you can disable the average hit points option for example. Your DM might create a custom option so that all characters in his or her campaign might get a small boost to hit points, a bonus feat, or an extra language at the start. These options can also be changed after you create your character. After creation the user interface will automatically navigate to the build tab and a menu at the top of the application with the name of your character will appear. 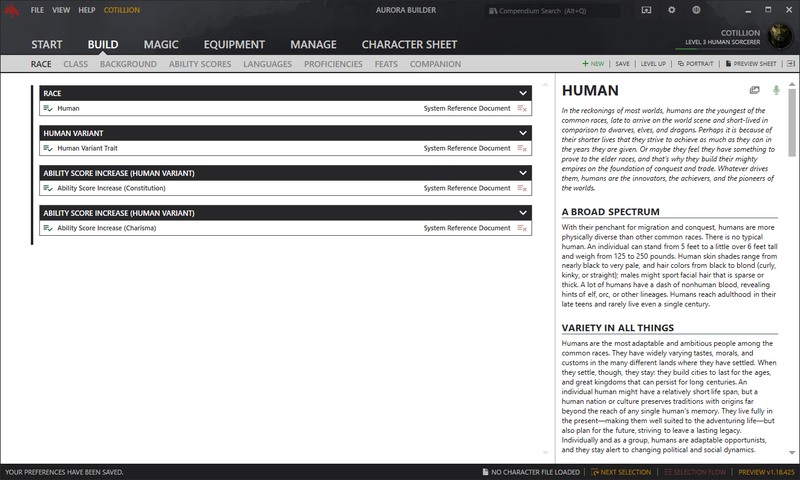 From this menu you can save your character, change the character options, save your character sheet, and more. In the build tab you can select all the elements that will eventually make up your character, such as your race and subrace, class and archetype, background, and more. Each selection picker has a list of choices available to you. Some options require you to meet certain prerequisites such as a minimun ability score or a specific race or class, these options will be available to you as soon as you meet these requirements. When your race has options for subraces an extra selection picker will appear in the Race tab under the race selection. The same applies to the other tabs in the Build tab. You archetype selection will appear in the Class tab after you selected a class and meet the requirements for your archetype selection, usually level 1, 2 or 3. When you have selected the Feats character option you will have the choice to select either an Ability Score Increase or a Feat at certain levels. These options appear in the Class tab. When you have no ability to select a certain type of element such as a feat or a language, the tab will be entirely empty apart from a message saying that there are no options available. Some selection pickers are optional and will say so in the header, you can decide if you want to pick anything here. Sometimes these selections are variants on other selections such as the Human Variant on the Human race, or variants on Backgrounds. There are also optional selections that don't directly implement rules but are for roleplaying such as your former occupation in a background. When you select any of the options in the selection picker, details about this selection appear in the description panel on the right. Here you can read everything related to the selection. When you want to know more about the selection, there is a link at the bottom of each description that will open a browser window with details about the source of the selected option. You can also make a snap shot of the description and save it as an image by clicking the picture button that appears in the upper right corner when you hover over the description panel. Depending on the Ability Generation Option you have selected you can generate your ability scores in the Ability Scores tab under the Build tab. You can for example increase and decrease the base score if you have the points buy options. Alternatively, you can generate random scores in other options. You can also drag and drop the scores around ontop of eachother to switch them. When you get ability score improvements from your class (or other sources) selection pickers for those abilities will be added to this tab. When you have selected a class or archetype that has spellcasting you might need to select cantrips, known spells, or prepare spells from your spell list. There is one tab for spell selections that has filters you can use while selecting a spell. You first select one of your selection options at the bottom. When you do so, the list of spells will populate and you can double click any spell to select it. You can select another spell instead simply by double clicking it. 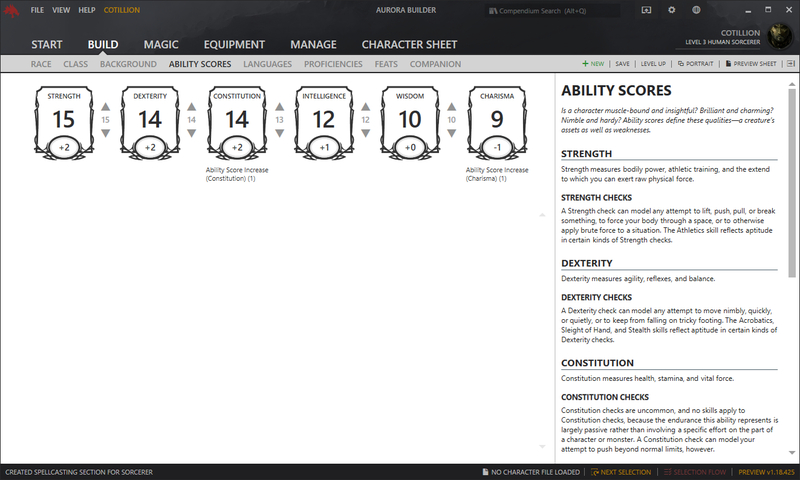 Each spellcasting class or archetype has an individual tab with its name right of the spellcasting selection tab. Here you can find information about your spellcaster such as the ability with which it casts spells, its attack modifier, difficulty class, and spell slots available to you. It also has a list of selected spells and cantrips that are available to you. When your spellcasting class requires you to prepare spells you will see this also in the bar at the top. You can prepare a number of spells by double clicking any spell that is in your list. You can select and add items to your inventory, they will be listed on your character sheet. Also, you can manage your currency from the equipment tab. You can equip items from your equipment in certain slots when the item allows you to do so. Only items that are equipped are taken in account in statistics such as AC. Also, there are class features that grant certain bonuses depending on you having equipped no heavy armor or no shields. These statistics are calculated aswell depending on the equipped items. All other details about your character, such as your name, age, height, skin color, background description, allies, trinket, and more can be changed here. This is also the place to select your alignment and optionally a deity. In the upper right corner of the builder you have a small round portrait of your character. 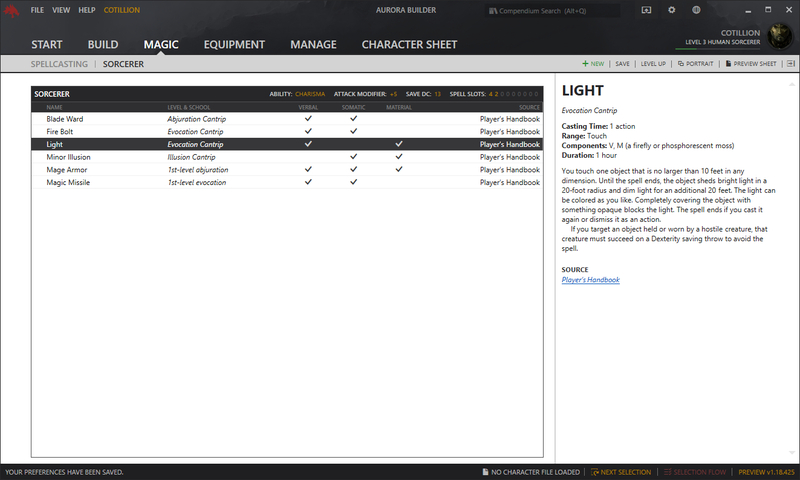 You can click this to bring up an information panel with a small summary of your character. This panel shows your proficiency, hp, initiative, speed, hp, ac, skills, saving throws, and various additional statistics depending on the character such as sorcery points or ki points. Change your character's portrait from the Portait Gallery. You can bring up the interface from the View menu, clicking your portrait in the Character Information Panel, or by using the shortcut (CTRL+P). At some point you'll want to advance to the next level. You can do this from the level up & multiclassing interface. When you level up a class you might have new selection pickers available to you. Also, when you meet the requirements for multiclassing you might want to add a multiclass from the same window instead of leveling up your current class. When you do so, you can selected a new class from the Class tab in the Build tab. In the Character Sheet tab you can preview your sheet. 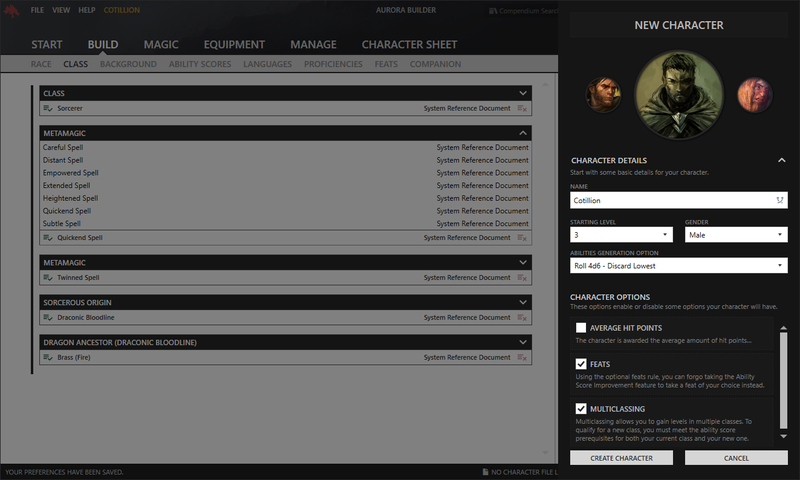 You can enable several settings to adjust the output of your character sheet when you save it. There is a setting available to append spell cards to the end of your sheet, flip ability scores with the modifier, and enable edit mode on the sheet so it can be editable afterwards in Adobe Reader for example. The Character Sheet tab has a Fillable Fields tab where you can enter additional content to specific fields that have not yet been fully implemented.